St. James' is a Gothic revival style wooden structure which features a high lancet arch roof system with studded walls, and timbered flooring on a stone foundation. On April 9, 1860, the foundation lines were marked out and two days later the site was fenced. 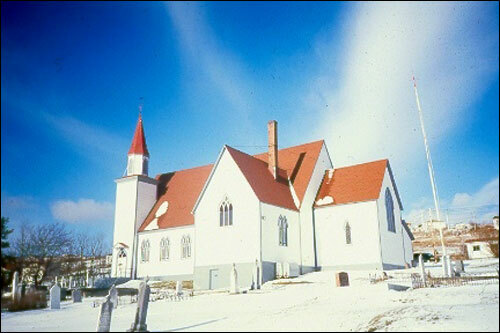 Ground was broken on May 7, 1860, and work continued until June when a large portion of the congregation left for the annual Labrador fishery. The resulting shortage of volunteer labour unavoidably slowed construction. In addition, the fishery was a failure in 1863 and again in 1864, which caused financial strain on the parish. St. James Anglican Church is an good example of a typical small High Anglican church built in the Gothic Revival style in rural Newfoundland during the Victorian period. Nevertheless, the new church was completed in three and a half years and was consecrated by Bishop Feild on November 10, 1864. The St. John's "Times" newspaper of November 19 reported the event and commented on the church's spaciousness and unusual roof construction, particularly noting the pleasant absence of supporting pillars which allowed for an unobstructed view of the chancel. The Revered Mr. Godden organized the construction of a rectory and the south transept of the church. This was consecrated by Bishop Jones on November 16, 1886. For its first forty years, the church had no pipe organ, but by the start of the twentieth century, the congregation acquired a barrel organ. This organ, of undetermined age, was considered a curiosity even at that time. St. James' has been continuously utilized as a place of worship since its construction. The building was designated a Registered Heritage Structure on September 15th, 2001 by the Heritage Foundation of Newfoundland and Labrador. Also view the St. James Anglican Church Registered Heritage Structure on the Heritage Foundation of Newfoundland and Labrador web site. The Newfoundland and Labrador Heritage Web Site has on its site only a portion of the registered heritage structures in Newfoundland and Labrador. To view a complete list or search for a particular structure visit the Heritage Foundation's Property Search page.